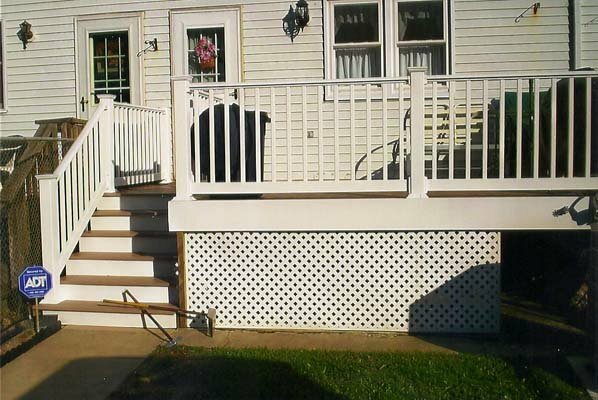 Are you ready to add a durable and low maintenance composite deck to your Howard County home? Do you want a deck that has the pleasing aesthetics of wood but requires little maintenance? AZEK composite decks are all the rage in Howard County, as homeowners love its durability, low maintenance and visually pleasing characteristics. Let’s take a look at some of the many benefits of composite decks. Every homeowner would like a visually appealing deck, but they also want to make sure that their deck is durable. While Maryland is known for fairly mild weather, Howard County does have its fair share of intense summer storms and heavy snowfalls. Material made of wood will start to wear down overtime, but AZEK composite decks can withstand whatever Mother Nature wants to bring our way. AZEK decks are specifically designed to resist stains, mold and mildew. If you have young children or pets, you probably worry about the dangers that warped, rotted and splintered wood can create. You won’t have those issues with AZEK. Everyone wants to get a wooden deck, but most people do not consider the cost of maintaining a deck made of wood. Staining, painting and treating a wooden deck is the only way for it to keep its luster, and many wooden deck owners feel overwhelmed with all of the maintenance. Composite decks, on the other hand, require very little work. A light cleaning or power washing is about the only maintenance required for an AZEK deck. Howard County homeowners want to protect the value of their property no matter what state the economy is in, and according to Remodeling Magazine’s 2015 Cost vs. value report, composite decks can provide as high as a 77% return in certain areas of Maryland. If you plan on selling your home, prospective buyers do not want to deal with a deck that is falling apart or have to build their own. This is a great way to protect the current value of your home, as well as help it sell faster in the future. With 40 years in the home improvement industry, Freedom Fence and Home has earned a reputation for high quality work and even higher quality customer service at an affordable rate. Our experts are ready to help homeowners design the deck of their dreams! Click here to view our deck gallery. In the meantime, if you have any questions about AZEK Composite Decks, please contact Freedom Fence and Home by calling 443-271-6841 or visit our website. You can also follow us on Facebook and Twitter! This entry was posted on Friday, July 17th, 2015	at 1:08 pm	. Both comments and pings are currently closed.